Two food-related stories have been making the rounds in Ottawa this spring. First is the great patio debate: how much should businesses pay for the right to operate patios on City streets? 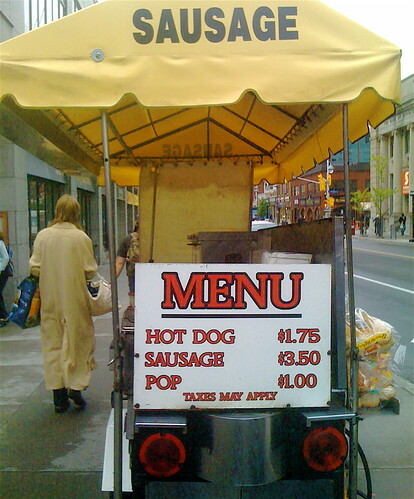 Second is the street food question: why is it so difficult for street vendors to offer more than poutine and sausage in food trucks and food carts? Each issue is governed by a discrete set of government regulations, but have a common implication for the livability and enjoyment of city space. The patio issue is one of public space, as articulated by the municipal encroachment by-law . This by-law defines how public space is governed when a private business seeks to use and/or profit from a space that is owned by the City, such as a sidewalk or a piece of city property used for parking. The regulation also sets out a schedule of fees the City may collect from businesses for the use of these public spaces. The intent of the regulation seems fair as it allows the City to collect a form of rent from private businesses that profit from the use of a space that is ostensibly free to everyone. A recent staff report notes that the fee is justified as restaurants with patio space gain a competitive advantage because the patio increases the size of their restaurant. The downside to this arrangement is that the space becomes privatized and is no longer free; rather it is only available to paying customers. The by-law also regulates the permissible distance of patios from residential areas (no more than 30 metres). Recent debate about this policy at the May 4th meeting of the Transportation Committee focused on lowering the patio fees charged to businesses, with specific emphasis on business owners impacted by construction on Preston and Bank. The committee also considered lowering the fees as a form of economic development to encourage more business owners to open patios. The staff report found that an overall lack of available space to operate patios was the greatest hurdle to opening patios, not the fees as suggested by business owners and some councilors. The report goes on to state that a comparison of patio best practices in other municipalities is not possible given the difficulty in comparing municipal objectives. As reported in the Ottawa Citizen , the fee structure issue dominated the committee meeting. However, the lack of comparable municipal objectives should be of interest to the City and businesses. The encroachment by-law provides a standard through which to think through uses of public space in general, but has very little to say about food in particular. Specifically, the by-law does not consider how food might contribute to enlivening public spaces. This is of particular relevance as the construction undertaken on Preston and Bank is in part motivated by the desire to improve public spaces. A similar disconnect between the regulatory environment and permissible food practices is apparent when discussing street food. Ostensibly governed by the Health Protection and Promotion Act , street food vendors are regulated by a set of rules that restrict the types of foods and food preparation practices permitted on the street. Like much food legislation in this country, these regulations are based on an antiquated set of rules about the food service industry that assume that food producers and vendors are harmful to human health. This legislative preoccupation with health and safety doesn’t jive with public discourse about access to exciting, nutritious and tasty food. As highlighted by Sally Roever in a recent Spacing post , there are a growing number of calls from people in Canadian cities to create a greater diversity of street food vendors. For instance, a petition in Ottawa has been circulating this spring to establish “a vibrant, eclectic and local-minded food cart culture in Ottawa” that can create better communities through sound economic development, use of public space and sense of healthier living. For these people, street food is not a narrow public health and safety issue, but rather a way to develop vibrant and exciting public spaces with food as a public, communal and shared experience. The City should therefore start thinking more concretely about how food can create more vibrant public spaces. Food brings people together, can enliven streets and spark discussion and debate about myriad issues ranging from ethics to the environment and multiculturalism. Unfortunately, the role of food in the context of city life has not yet been comprehensively addressed in Ottawa; rather it is a discussion that remains hidden by narrow, single-issue concerns. Ottawa should consider developing a municipal food policy that clearly sets out the role that food can play in contributing to urban life. The patio debate and availability of more diverse and interesting street food can help the city and its citizens recognize how food affects the quality and enjoyment of public spaces. This is a great post. Ottawa has a lot of public places that are passive. Food could help to make some of these places into gathering places for residents. Four things that attract people are shopping, sports, music and food. A lot of our public places are missing these things.